We arrived in Atlanta – after a four-hour drive – tired, hungry and weary. One late afternoon nap later, we made our way to the Atlanta Botanical Garden. 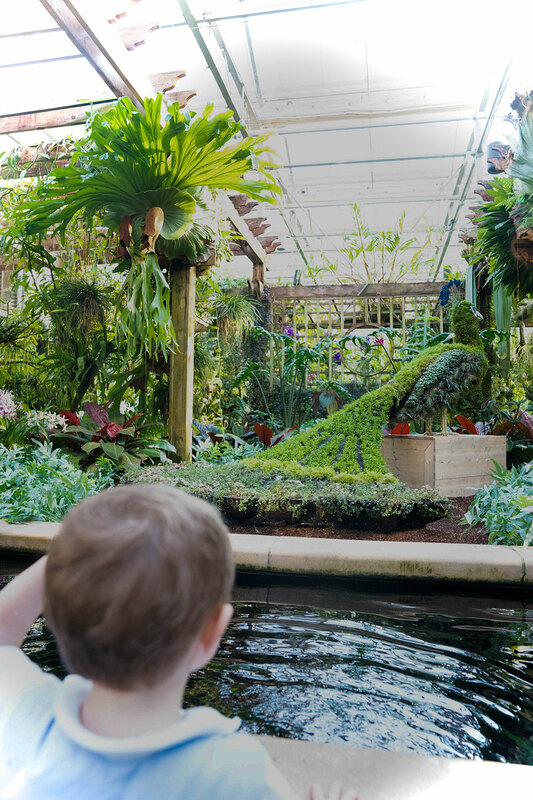 The Atlanta Botanical Garden is very large and completely breathtaking, with gorgeous fountains, sculptures, and several greenhouses featuring orchids and tropical plants. Brightly colored flowers are in bloom everywhere. And there are countless open green fields, plus park benches scattered throughout the gardens under shady trees. 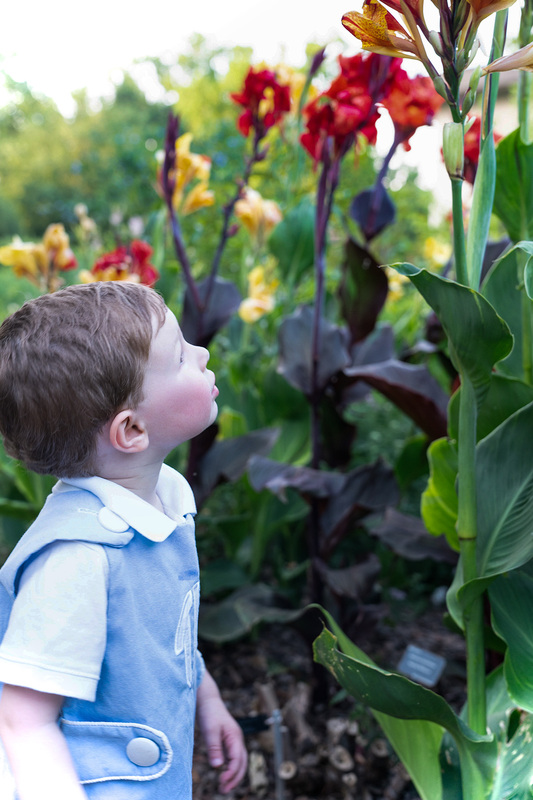 As stunning as the gardens are, the Imaginary Worlds living sculpture exhibit is the real show-stopper here. The amazing topiary-like sculptures are over-the-top beautiful and intricately detailed. 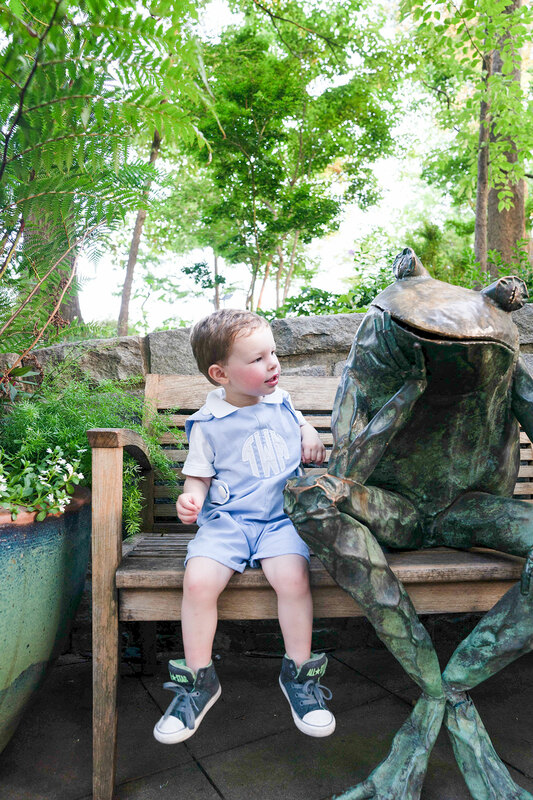 It’s no exaggeration to call the living sculptures “enormous,” some are as big as 26 feet tall. 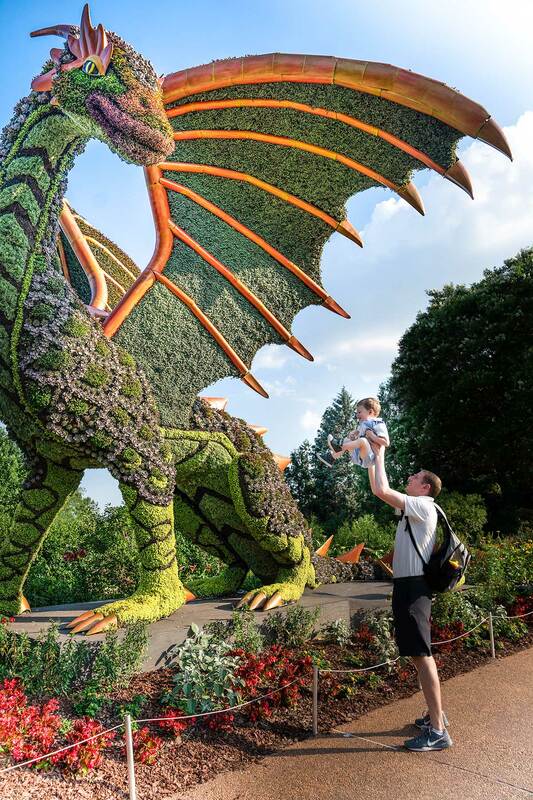 Living sculptures – also called “mosaiculture” – were originally developed by an organization in Montreal, Canada, and they are truly fascinating. The sculptures actually begin as steel frames that are then covered with soil. Gardeners then custom design the living sculptures by adding thousands and thousands of vividly colored plants, each by hand. Since there was so much wide-open space for Trevor to explore at the Atlanta Botanical Garden, he was happy and content during our visit. So we were able to check out all of the Imaginary Worlds sculptures while we were there. There was a Mermaid perched over a garden fountain, her cascading green “hair” reaching her waist. We loved the Three Camels walking in a line across a colorful bed of flowers, each one carrying vividly beautiful “cargo” on his back. The Phoenix was majestic, wings fully outstretched, perched on a stone wall. And, inside one of the greenhouses, we caught sight of the Peacock with a green “feathery” tail cascading behind him. 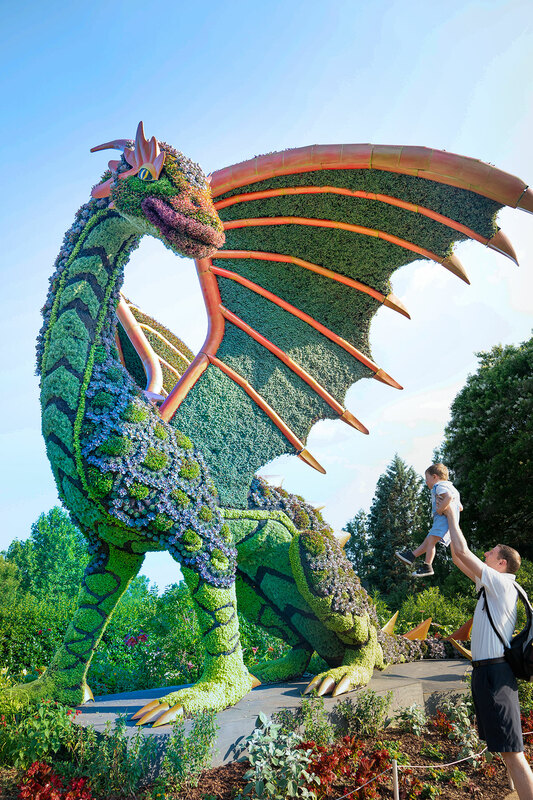 Our favorite was the Dragon, who was truly enormous, vividly colorful, and full of intricate detail. 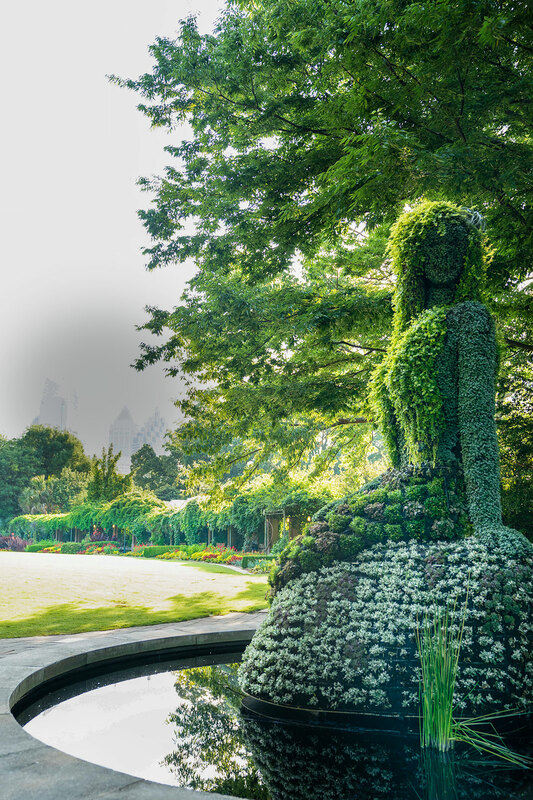 Another incredible living sculpture, not a part of the 2018 Imaginary Worlds but a permanent fixture at the botanical garden, is Earth Goddess. We arrived to see Earth Goddess just as the sun was beginning to set, lighting up the lake with an explosion of warm color that matched the earth tones of her cascading hair. It was absolutely stunning to see in person! Where Is The Imaginary Worlds Exhibit Located? 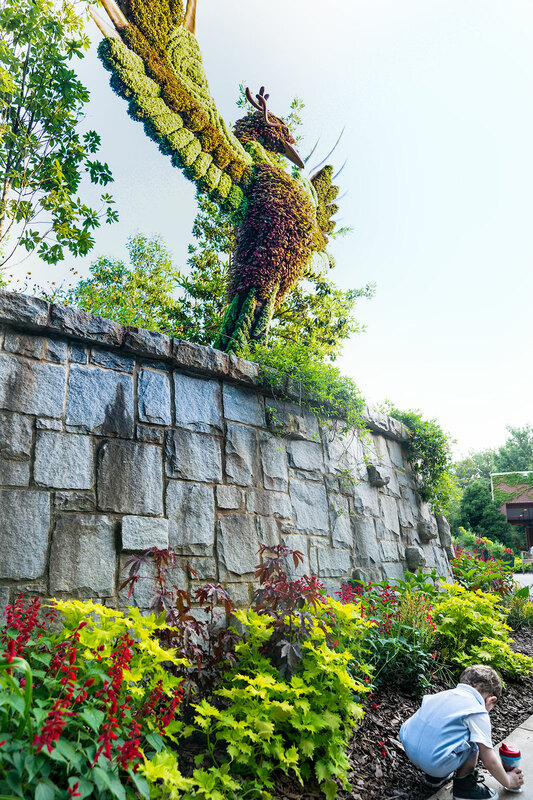 The living sculptures are scattered throughout the Atlanta Botanical Garden, and are included with admission to the garden. Tickets were $21.95 for adults at the time we went (Trevor received free admission for being under the age of 3). When Does The Imaginary Worlds Exhibit Run? 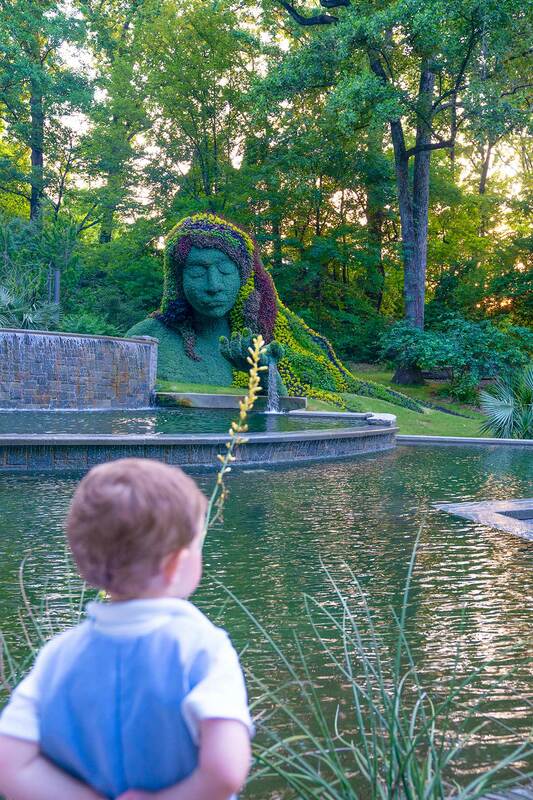 The living sculptures are on display at the Atlanta Botanical Garden through the warm months of 2018, from May until late October. 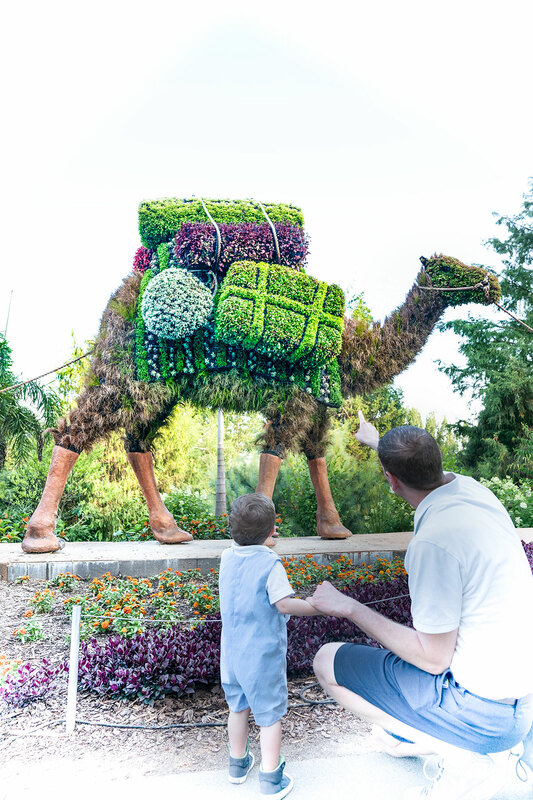 The living sculpture exhibit is a collaboration between the Atlanta Botanical Garden and the original creators of “mosaiculture,” International Mosaiculture of Montreal. Is Imaginary Worlds Open After Dark? We went to Atlanta Botanical Garden on a Thursday evening because the gardens are open late on Thursdays (until 9:30pm). 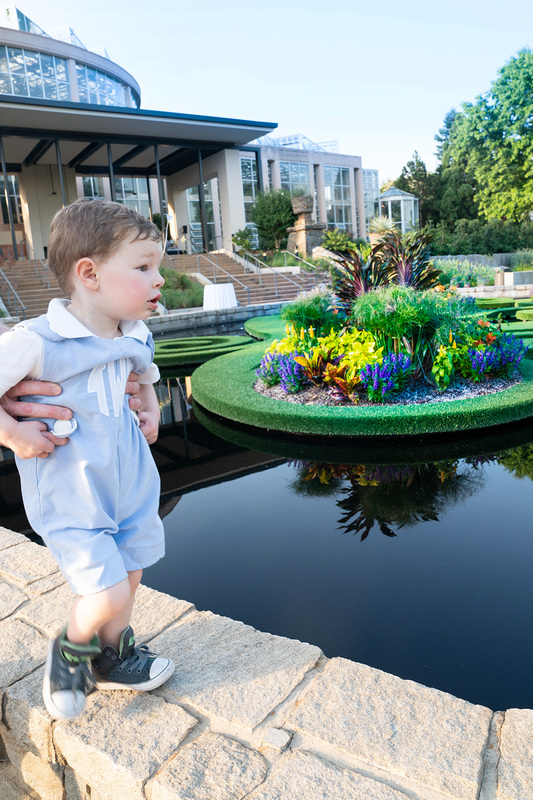 Although it was too far past Trevor’s bedtime and we couldn’t stay to see it, the living sculptures are actually illuminated after dark on Thursdays!